Our family of 5 plus another family of 4 stayed at John's house this past MLK weekend. We almost thought we were lost trying to find the house as we had to go through a long, snowy, winding road up to the house! But once we arrived, we were pleasantly greeted by a large house with all the amenities we could ask for in a house! The beds were comfortable, there was more than enough space for all of us (including a "kids" room downstairs with a bunk bed and full size bed...this is also where the TV was for watching a little Sunday football), the kitchen had more than enough pots and pans for our daily family dinners, and we loved the roaring fires from the fireplace! From the house we were able to ski at Whiteface within a 15 minute drive and also went ice-fishing. We loved staying here and would highly recommend Camp Edelreiss! House was well appointed, steps from the lake. Really enjoyed the walking trails that thread the entire area. We will be returning! We loved staying in Camp Edelreiss. The house is very nice, lots of space, clean, and comfortable with a wonderful screened in porch. The location is perfect, close to town, hiking, swimming and fishing. We spent a couple very hot days swimming and fishing by the dam which we could walk to in 2 min! There is no AC so the upstairs got quite warm in the 2 days of 98 degree heat, but the finished basement stayed nice and cool. We had a wonderful stay and we're so glad we could be with our entire family for Thanksgiving. 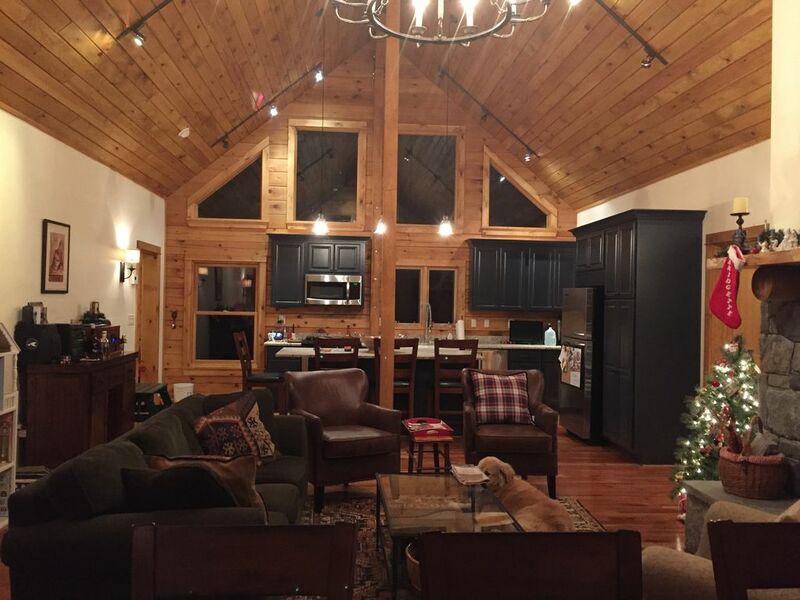 The home was beautiful and located in a gorgeous part of Lake Placid. The trails to damn and along the lake were fantastic. The home was everything we had hoped for. This place was truly amazing. Lots of space, short walk through a nice hiking trail to get to a beautiful lake, and extremely generous and beautiful amenities. This place is VERY secluded. We're talking a trek down a narrow dirt road for about 1/2 mile. This provides a lot of privacy which was a nice touch. However, not ideal if you wanted quick access to town. I would highly recommend this place to anyone that is looking for a private retreat in a beautiful home on a beautiful piece of property. We had the opportunity to stay at Camp Edelreiss twice-once in the summer and once in the winter. We love the attention to detail throughout the house and the high end finishes. The beds were very comfortable and the rooms were spacious. On most nights we enjoyed large home cooked family dinners around their lovely dining table. From the large deck, it was fun to cheer on family members in the horse shoe tournament. After the kids went to sleep, we enjoyed wine on the screened in porch tucked into cozy furniture and with lovely throws. On colder nights, it was great for the family to play games around the fireplace. Winter or summer, the setting is ideal and we love that the house is right on the Jack Rabbit Trail! On a few occasions, we hiked to Dack Shack for burgers and beer, hiked back and stopped for a swim at the dam on Lake Placid. Can't beat that! Sheets and towels are provided. Washer/Dryer room.